Teachers have a great influence on their students. Their attitude, approach, reproach, and how they even address their students can go along the way into determining if they even get better results and become successful. 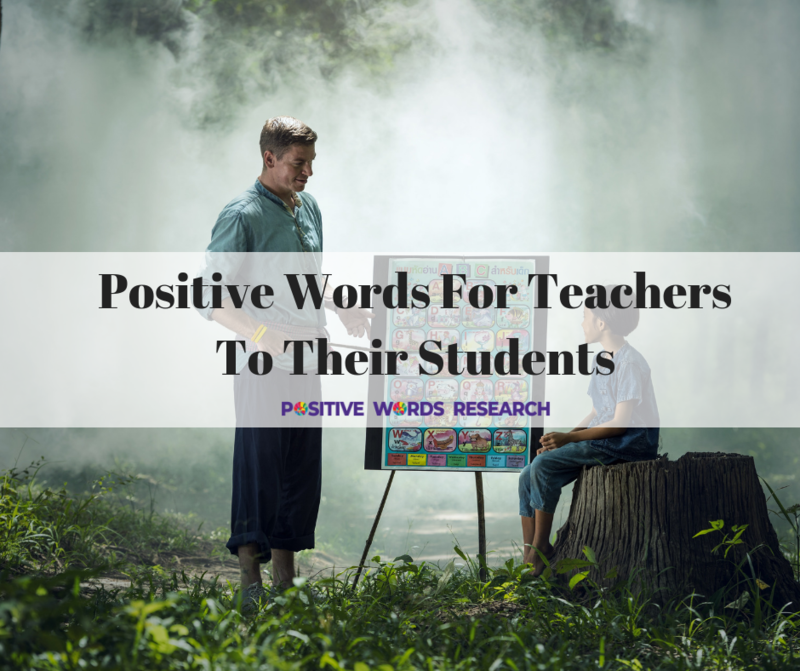 Being positive and using positive words on your students while conveying lessons goes a long way into building individuals who have a positive attitude too. It is therefore paramount for teachers to ensure that they work to model a great student with what they say and do. Thesis editor is also a good place you can look for help in terms of language to use. Below are some of the positive words for teachers to use on their students. We all need someone to believe in us as well as we believe in ourselves. As a teacher, it is important to show students that you do believe in them and their abilities. This sends a great message of affirmation. Positivity allows them room to explore their abilities and achieve their goals. It also helps them to be more of active listeners, work with others collaboratively with the aim to achieve what they set out to. It is paramount for teachers to always reinforce their belief in their students while supporting them to be the best versions of themselves. Words can have the biggest impact on a students life. Depending on the circumstances and the environment in which we convey our messages, they can either build or destroy them. Using positive words with your students is a great step to help in molding them in a positive way. You should also encourage to use the same and practice doing so on a daily basis. It is important to allow students to reflect on the negative connotations they utter so that they can find meaningful utterances they could replace them with. This will not create a positive environment in places of learning, but it will also allow students to learn to bring positivity to their speech. Honesty is something that most people struggle with. Showing compassion and being direct with your students is important. It allows you to build a trusting relationship with them as they feel that you respect them and you wish them the very best in their endeavors. Being honest also allows them to see that you support them and are willing to give them positive feedback that they can build on. A good example is instead of asking" Could you wait for your turn to walk out, you could let the student know that “the expectation is you would wait for your turn to walk out". Such kind of communication shows your students that you can convey messages directly and with honesty which allows room for trust. Avoid using the word “Don’t"
This word delivers a negative connotation and most people find it so easy to use it. You can work on replacing this with more positive statements. A good example would be, instead of saying something like “Don’t bring phones to my class" you can replace this with “ We all know phones are distractive, and that is why we prefer to leave them outside". Positive language helps create positive habits as well as allow students to make informed choices by even choosing what they speak about. Positivity in a learning environment is key, especially when this positivity trickles down from the teachers to their students. As mentioned, teachers play a major role in influencing their students. It is therefore extremely important if they maintain a positive attitude and say positive things to their students. This will not allow for academic excellence for students, but they will also be able to influence those close to them too. Write my paper is another great place you can find more tips on positive things teachers can say to their students. Why is it so damn important to write a good resume? If you’re educated, trained or experienced, shouldn’t that be enough for an employer to hire you? The answer is: NO. You have to fight for your spot and use everything you’ve got to impress the person looking into hiring you. The first thing your potential employer learns about you comes from your resume. And we all know how important a first impression is. Your resume either makes you or brakes you! In order to make it perfect, you need to choose the best words to use in it. I’m going to help you do that. Your resume is about your skills, expertise, level of experience and your overall work ethic. In order to show your employer what you’re made of, you need to make an effort in finding the right words. I’ve created a base of good words to use in a resume. Take a look at the following skill categories. See what you can find useful in showing you made a serious effort prior to sending your application in. It’s crucial to point out your work ethic and skills related to it. Instead of saying “hard-working" or “responsible", you need to be more precise. Use words which explicitly indicate what kind of a work ethic you’ve built and what would you bring on board if they hired you. Studious – This is a much better option than “Ready to learn!" It’s precise and to the point. Thorough – It’s one word to help you avoid writing “Pay attention to details" which is worn-out. Attentive – Tell them this and you’ll dodge saying “Interested and dedicated worker". Dependable- “reliable" and “responsible" aren’t the worst words in the world, but this is still better. Meticulous – “conscientious", “precise" and “accurate", all in one word. Stewart Miller, a recruiter at EssaySupply confirms our theory: “I’ve read thousands of resumes. If I don’t see an effort in writing it, I toss it aside. Be thorough in writing it and it will pay off." Orderly – Skip the obvious: “organized" is a NO word. Systematic – You’re saying your “efficient", “organized" and “precise". Great word, right? Timely – Let them know you won’t skip deadlines or be late on meetings with this one word. Methodical – Sounds better than “well-organized", right? Cordial – Avoid the good old “warm and friendly". It sounds like a cartoon character. Respectful – This is a great communication skill. It shows you’re both “polite" and “considerate". Convincing – “Persuasive" sounds like you’re luring a child in a van with some candy. Collaborative – Better than “team-player", for sure. “Communication skills are gold! 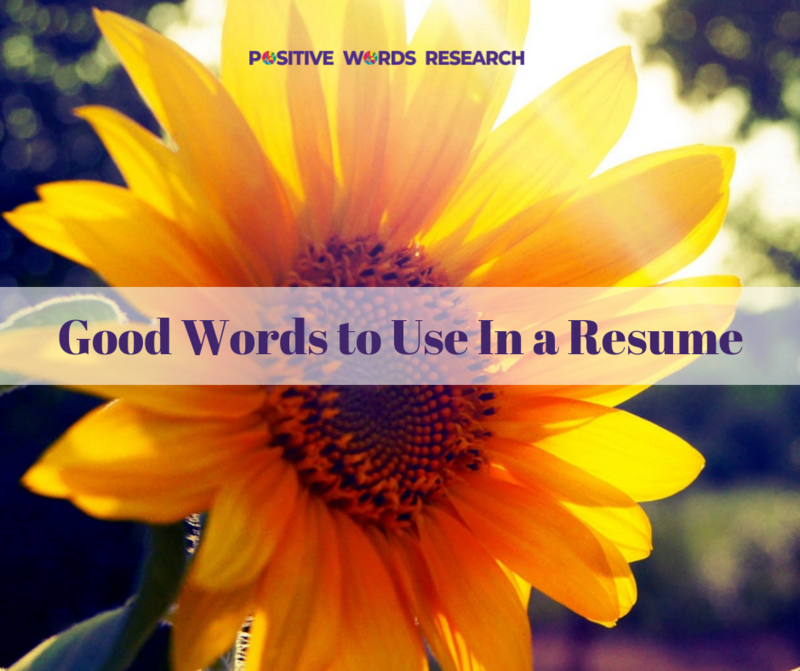 You need to make them shine in your resume by using appropriate vocabulary. Avoid being predictable. "- says James Daily, a writer at FlashEssay. Apart from using suitable and effective words to write a killer resume, there are other things to keep in mind. Take a look at other issues you need to deal with. Using power words is the key to success, but it’s not the end of the resume-writing story. Yes, there’s more to pay attention to. There’s one thing no employer is going to tolerate: an inaccurately written resume. A spelling or a grammar mistake can end your application before it even started. This is why you absolutely must ensure your resume is accurately written. In order to prevent looking unprofessional and eliminate any inaccuracies and errors from your resume, you can use online tools such as GetGoodGrade, ProWritingAid, or OnlineWritersRating. This is so old an cheesy. Your employer would probably roll his eyes after seeing it. Or even worse: “Prepared to work both individually and as a part of a team". It’s a NO from us. It’s the 21st century, everyone can use it. It’s not a “skill". Write your resume in 1st person singular. Period. Nobody cares about how you spend your free time. “A resume represents you and what you stand for. If you fill it with cliché phrases and empty adjectives, it means you made no effort. You’ll seem uninterested for the job and end up not getting it. "- explains Kevin Harper, content manager at ResumesCentre. Your resume speaks for you. And, you don’t want to sound uninterested, old-fashioned, cheesy or unprofessional, right? You want to shine in the eyes of your employer before you even meet him. Plus, you want to stand out from the rest of the candidates with the same education and work experience. Use the power words I’ve listed above. Spend quality time in writing your resume. Plan it, sketch it and improve it several times. The effort will be visible to those who read it, and that’s all you need for a great resume. 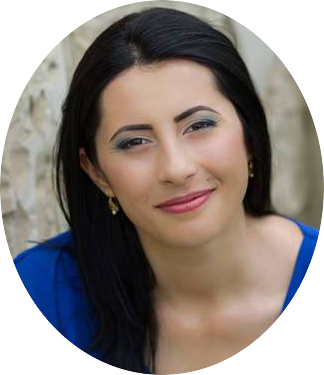 Bio: Sylvia Giltner is a career coach, HR specialist, and freelance writer. Her passion is to help people make career changes and get jobs they truly love by showing them how to take full control over their careers. Feel free to contact her via LinkedIn. There is an old adage that claims: “The number of languages you know is the number of people you are worth." Just imagine how incredibly valuable is it to know the most positive words in any language! The people who created The Word Point (website for translation of 40+ languages) certainly know the importance of this, so you can even contribute by translating your own! 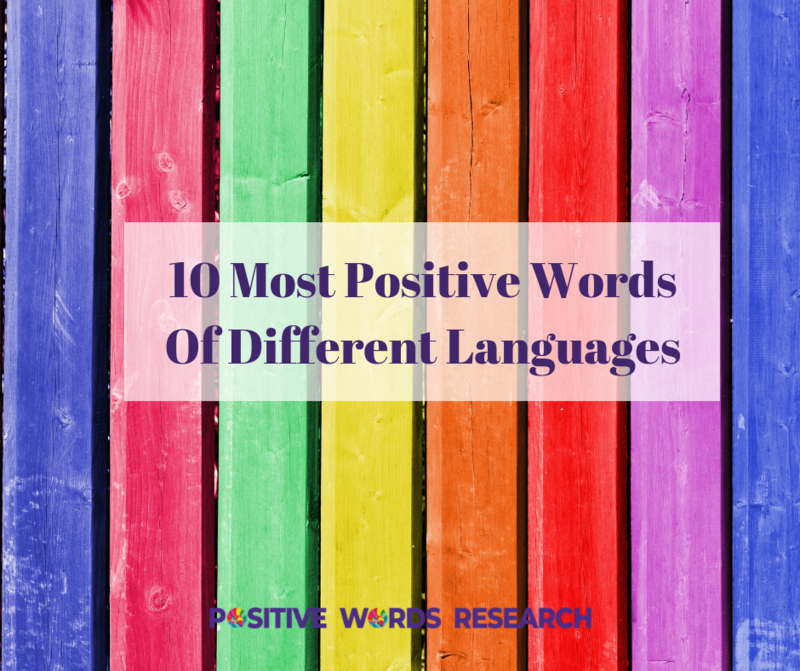 Inspired by their example, this time around we have compiled together an amazing list of ten most positive words of different languages. They are a magical example of how people around the globe create a beautiful vocabulary to express the beautiful ideas and feelings that are the building blocks of their world. Pirgun (Hebrew): this is one of those feelings that make people who feel them truly exceptional humans. If you are feeling “pirgun" (also sometimes encountered as “firgun"), it means that you are feeling great happiness and deep pride for someone else’s accomplishment, without being jealous or holding a grudge against them. It is certainly a very positive feeling and one we should all be able to develop. Morgenfrisk (Danish): as you might be able to guess from its spelling, this is a morning word – “morgenfrisk" describes that lovely feeling of being completely rested after a good night’s sleep. Considering how fast-paced our modern world is, it is nice to know that people still notice and appreciate this little joy in life! Solarfri (Icelandic): this word denotes a very peculiar little holiday. In Iceland, employees might be unexpectedly given a free afternoon, or the entire day off, when the weather is particularly sunny and warm. Imagine being given time off work just to enjoy the sunshine! If that does not make for a positive office life, then nothing does. Retrouvailles (French): This is a word for a reunion (with your family or your loved ones) after being apart for a long time. Even more than the English “reunion", it also carries the meaning of a wonderful surprise: literally, it means “rediscovery". Ukiyo-e (Japanese): the literal translation of this word, “floating world", will probably convey nothing to the mind of a non-Japanese person. However, it is brimming with positive philosophy. Ukiyo-e describes a person who lives in the present moment and lets all the minor distractions and life’s little grievances just roll right out of their field of attention. These people appreciate every minute and never take anything for granted. Forelsket (Norwegian): this word has been invented to describe one very particular feeling, or rather a phase of a feeling. It is meant to pinpoint that odd giddiness you get along the way to falling in love – when you are already past the stage of having a crush on the person, but you still have not reached the point of actually saying “I love you." Cafune (Brazillian Portugese): yet another wonderful word inspired by love, this refers to the act of tenderly running your fingers through your lover’s hair. Shinrin-yoku (Japanese): yes, this is a single word. The Japanese have come up with a name for the activity of going into the woods in order to calm down your mind and soothe yourself when the going gets tough. The literal translation would be “forest bathing". Zindabad (Urdu): This is a word of Persian origin. It is mostly used as a cheer, but it has another lovely little use: if you say it right after a person’s name, it turns into a well-wishing expression, a way to wish someone longevity and health, and it literally means “long live." Sonrisa (Spanish): sounds oddly similar to “sunrise", right? However, the actual meaning of the word is “smile". This is probably not a coincidence since they both definitely bring light and warmth to people’s days. Perhaps somewhat surprisingly, people around the globe reserve their most positive vocabulary for the small things in life: a nice day, spending time with family, or just smiling. It goes to show that no matter what may be happening in the world, we never really forget what the important things are. The Danish “hyggelig", roughly translated as “coziness", is a wonderful example of this which recently took the Internet by storm. Do you have your own candidate for the “most positive word" in your language? Let us know! The 4 pictures were accompanied by the words At this age I’m only interested in. I thought that these 4 words are actually words that we are interested at any age. Do you agree that we need consistency, stability, respect and loyalty most of the time? INEFFABLE (adj.) too great to be expressed in words. ETHEREAL (adj.) extremely delicate, light, not of this world. JOUSKA (n) a hypothetical conversation that you compulsively play out in your head. The words aurora, ethereal and jouska were not added to the list of positive words and I need to add them. The word jouska can be a positive word if it is a happy, joyful and positive hypothetical conversation. Have a lovely day. Hope you enjoy this tweet.